With a solutions-oriented approach and a fighting spirit, Reggie Douglas is the forward-thinking New York City real estate professional you need at your side. Throughout his career Reggie has consistently demonstrated a customer-first attitude with his elite sales skills, commitment to hard work and unwavering integrity. He knows that every transaction is different, so each interaction begins with listening to his client's unique needs and crafting a customized plan to exceed those goals. By leveraging Compass' best-in-class technology, Reggie truly embodies the future of real estate where an innovative, tech-savvy attitude combines with strong interpersonal skills to create stunning success for both buyers and sellers. 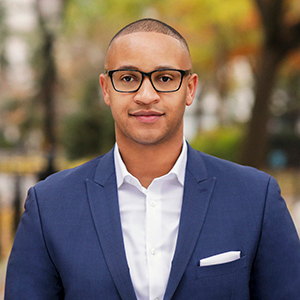 Named a rising star for his tremendous productivity in his first few years in the business, Reggie learned from the best by joining a top 5 team at Douglas Elliman. In that role, he worked closely with developers and new development teams to successfully launch luxury buildings in Manhattan and Brooklyn. Originally from Long Island, Reggie has a lifelong familiarity with the city. As a former athlete, competitive dancer and a Golden Gloves boxer, he has the fight you need to succeed in your next real estate endeavor.